L.I.F.E. fluorescence laser (Univ. 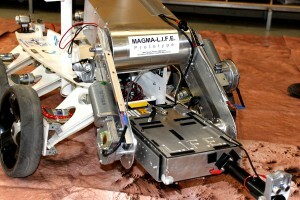 Innsbruck/OeWF) on board of the MAGMA-Rover during a laboratory test. First, in a scouting phase, possible Mars analogue sites in Europe and the neighboring Arctic are identified. In a second step, a stratospheric balloon will be constructed and launched both as a training project and as a precursor for the Rover phase. In a synergistic approach, hardware components like sensors and navigation elements shall be tested before being implemented on the Rover, which shall form the core of phase 3. In a fourth step, the man-machine interface between the rover and the analogue astronaut shall be tested, including interactivity requirements development and investigation. Preparation of a microspherule probe to determine the contamination vectors. Mars once had the prerequisite necessary for the emergence of life. However, the search for these diminutive tracers of biology (if they ever existed) is a complex search for call-wall fragments, biologically precipitated minerals etc. 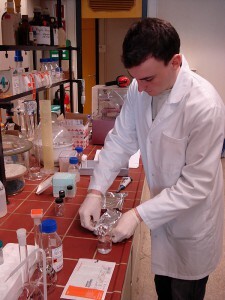 There is a significant of contaminating the very samples scrutinized for those tracers of paleobiology. Hence, the understanding of the potential contamination vectors is a mission critical technology. We were working with marked bacteria and fluorescence nano-particles – a technique developed originally during the OeWF AustroMars mission in 2006. The distribution and migration patters of biological “payloads” was being investigated under realistic exploration scenarios – such as sampling by robotic vehicles, a hand-over to astronauts, but also contingency situations which might lead to a breach of the biological containment. Analog research also meant that after a regional characterization of the geology and the (putative) biology, we compared our findings and hypotheses with the actual “ground truth” of that terrestrial Mars-analog site. This allowed us to determine how much a human-robotic mission might have missed on Mars where we do not have that level of ground-truth and accessibility of a terrestrial setting. Hence, using well known ground-truthed sites on Earth is an excellent instrument to evaluate the completeness of a sample and the effectiveness of an exploration strategy. That’s what PolAres was about. 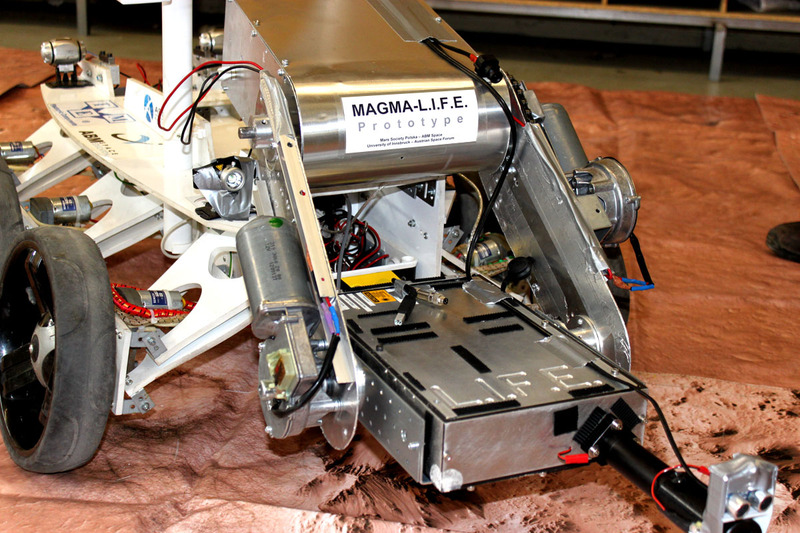 Rovers are excellent partners for manned missions to Mars: They can be used for dangerous or repetitive tasks. In addition, they can also function as a relay station, as an energy source, or transport rock samples and tools. 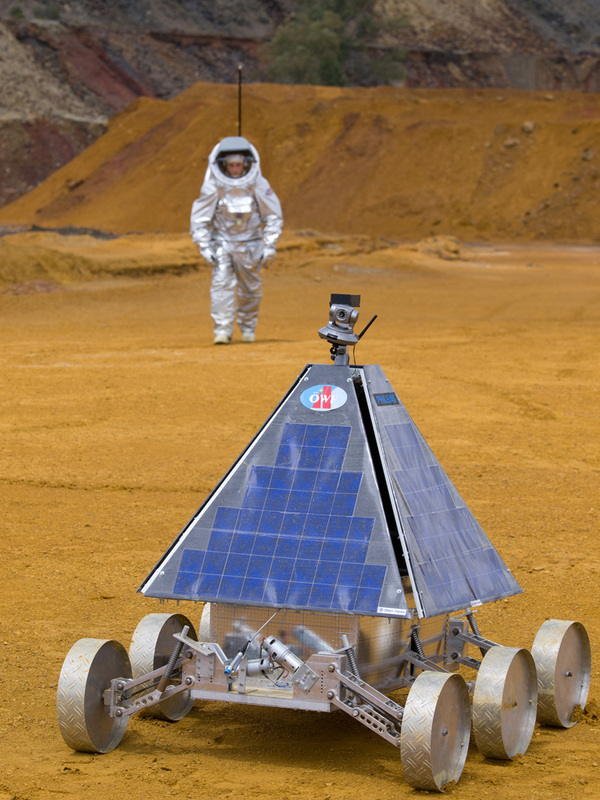 Other than the rovers which are currently on Mars, like the Mars Science Laboratory Curiosity or the Mars Exploration Rovers Spirit and Opportunity, Phileas was a conceptual model of a rover which is optimized for a mission alongside astronauts. 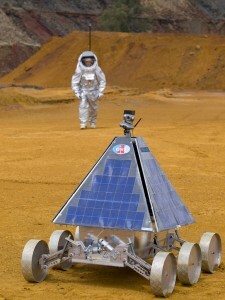 Three requirements have been defined for the PolAres rover Phileas: it must function in temperatures as low as -80° C, both in a desert or an arctic environment (robustness), it has must functionally operate over 80 days without any break or disruption of operation and cover 80km per day (endurance and range), and it must operate in any environment between 80 degrees latitude North and South (flexibility). These requirements demand a well thought thermal budget, sturdy components, and an efficient energy system. Phileas was developed in collaboration with the higher technical school (HTL TGM) in Vienna.